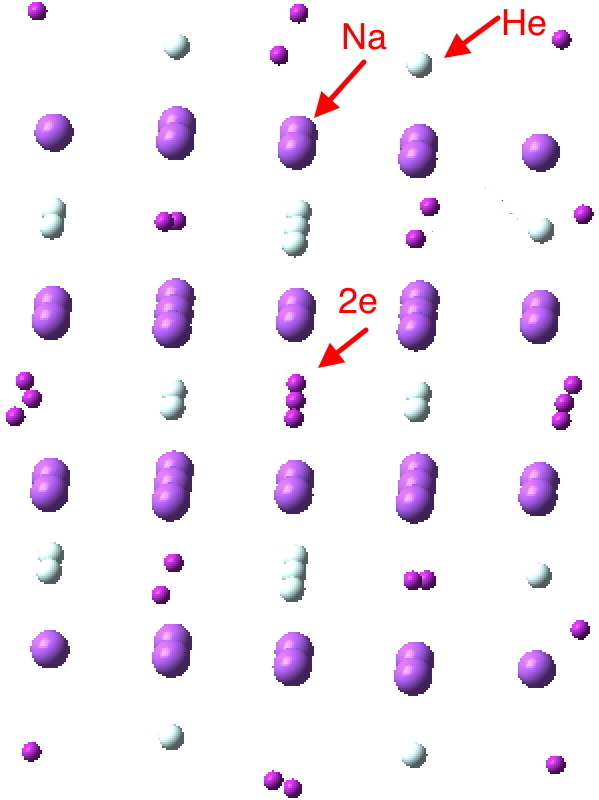 Computed charge density (eÅ-3) of Na2He at 300 GPa, plotted in the  plane of the conventional cell. The color bar gives the scale. 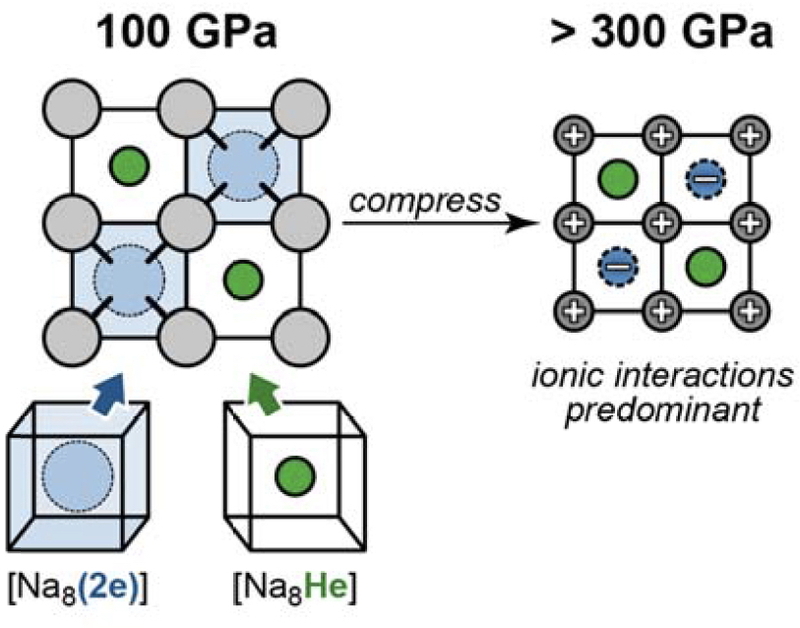 I found myself thinking that it would be great to have the first diagram represented as a movie, evolving as the pressure is increased from say ambient to 300 GPa, and presumably showing the “2e” feature (which means diamagnetic electrons) forming as the pressure increases. Would their evolution be abrupt (a step change) or gradual as the pressure increases and the interatomic distances all decrease? 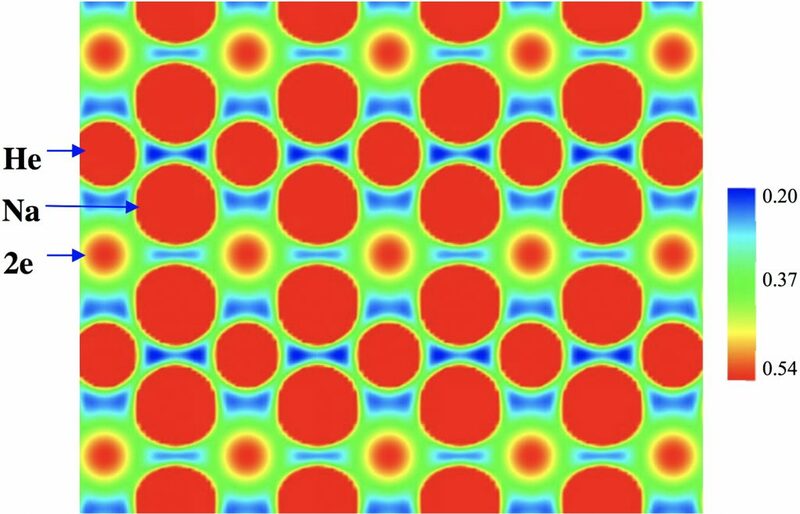 As I understand it, this chemical phenomenon is due not so much to the usual coulombic attraction between positive nuclei and negative charge density from the electronic wavefunction leading to e.g. covalent bonds, but to electron repulsions induced by decreasing nuclear separations resulting in electride-like ionisation and hence electron localisation into the “interstitial cavities” of the lattice. Without pressure, you would just have sodium and helium atoms! The urge to obtain this intriguing electronic wavefunction for myself now appeared (wavefunctions are rarely if ever included in supporting information). To do this you must have atom coordinates available, But such data was not to be found in the supporting information. It was eventually tracked down (by a crystallographer; thanks Andrew!) to the caption in Figure 2. However, you probably do need to be a crystallographer to convert this data into a set of coordinates. This was done and is here deposited as a CIF file for you to play with if you wish (DOI:10.14469/hpc/2154). 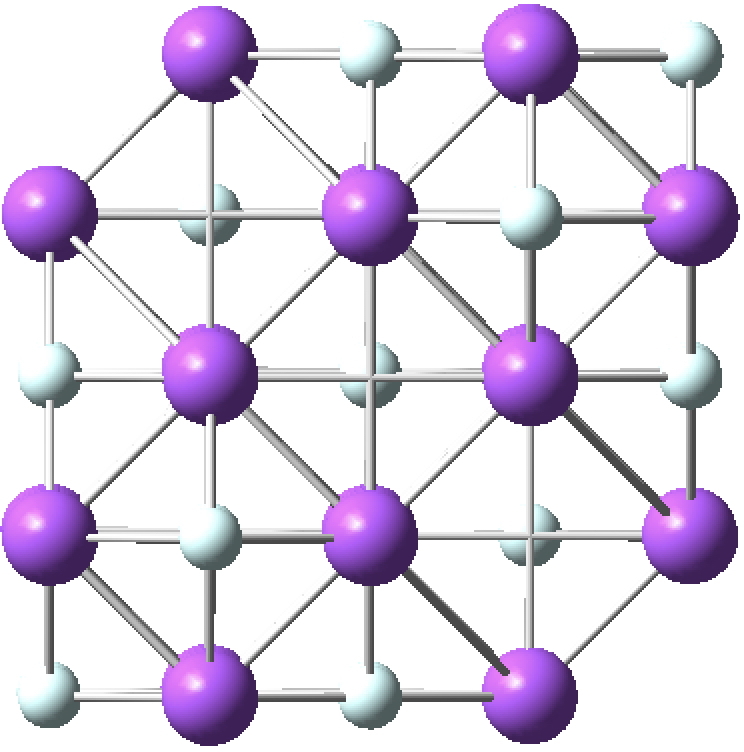 I have reduced the packing of the unit cell obtained from this CIF file (198 atoms) to just 60 and you can enjoy them by clicking on the diagram below. I should point out that if one uses a program that can recognise the periodic lattice such as Crystal (used in the article discussed here), there is no need to make such reductions, but in this instance I wanted to use a program such as Gaussian in discrete (non-periodic) mode, for which the calculation (B3LYP/Def2-SVPD) has DOI: 10.14469/hpc/2156 and where you can also find a wavefunction file to play with if you wish. An ELF analysis for this non-periodic wavefunction looks as below. 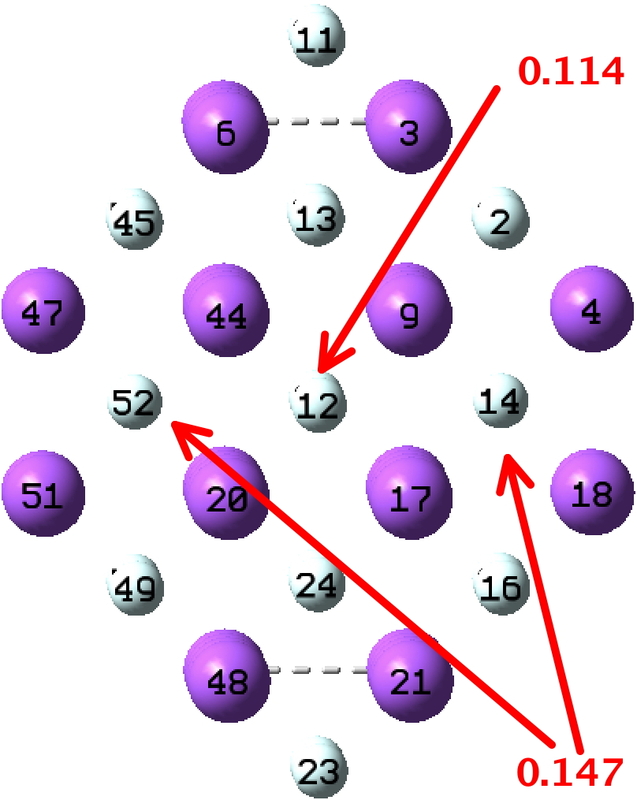 The ELF basins labelled “2e” located in the centre of the cube show an integrated electron population of ~1.9e and correspond to the localised electron pairs noted in the article above. The basins on the boundaries of this non-periodic unit show reduced integrations (red arrows below, 0.08 – 1.7e) and are artefacts of the non-periodic approximation introduced. The ionization into an electride is brought about by the close proximity of the atoms as induced by high pressure. Releasing the pressure would allow the ionized electrons to re-attach themselves to the valence shell of the sodium atoms, thus destroying the unique properties of the system. It is certainly true that this system challenges our normal concepts of what a molecule is. The presence of He is essential and yet its electrons are hardly involved in the re-organised wavefunction. I cannot wait for more examples to be discovered! †To meet the 55 minute deadline, I was given about 15 minutes thinking time! ‡Instant responses on social media now seem a sine qua non of the political world, so why not the scientific one😛! This entry was posted on Saturday, February 11th, 2017 at 2:07 pm and is filed under Bond slam, crystal_structure_mining, Interesting chemistry. You can follow any responses to this entry through the RSS 2.0 feed. You can leave a response, or trackback from your own site. Really interesting. However note that the presence of “non-nuclear attractors” has been demonstrated many times and their origin has been best described by Pendas and coworkers in: Phys. Rev. Lett. 83, 1930 (1999). 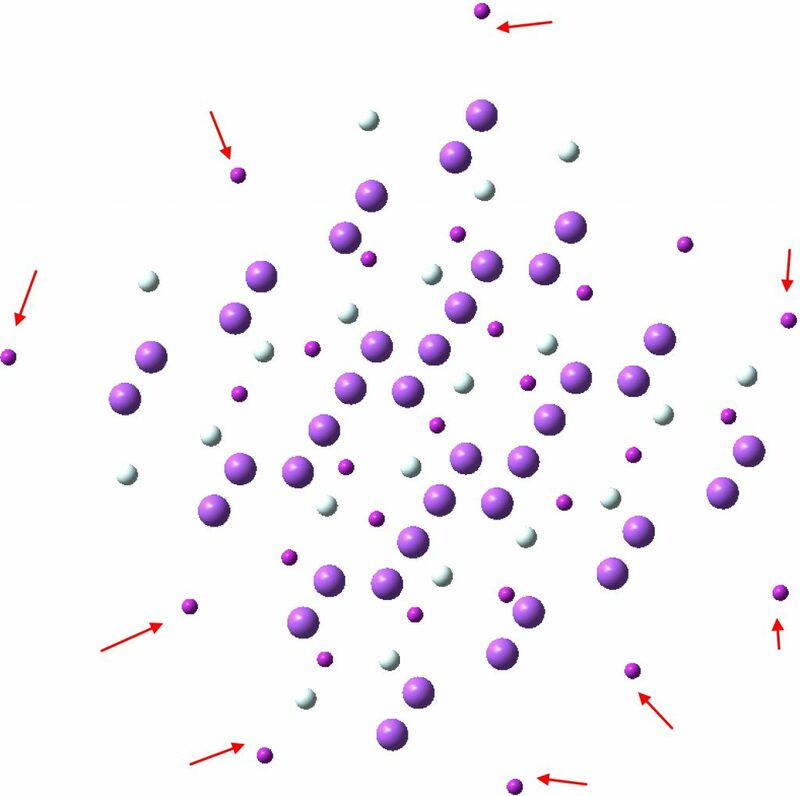 It is also interesting to check whether such features also emerges from “promolecule” model density where no interaction between atoms are assumed to check whether this feature emerges from bonds not simple sum of atomic densities. Do check on the extensive discussion for the electride blog, where this and many other features were covered. 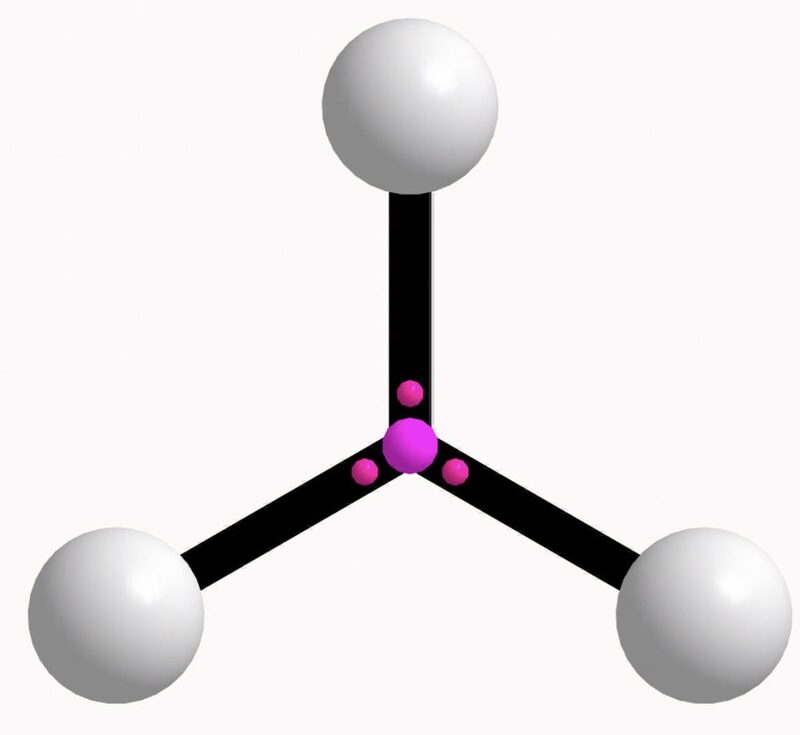 One of the simplest molecules by the way exhibiting “NNAs” or non-nuclear attractors is triangular H3+, where the two electrons are associated with a NNA in the centre of the triangle. Another with an NNA is actually F2, but this arises from the charge-shift character of the bond. For my unit of Na40He20 I did set a QTAIM calculation running to check for NNAs, but the code I used (AIMALL) suggested the calculation as I requested it would take several days. PS: added here the QTAIM analysis of H3+, showing the NNA in the centre, and the three LCP (line critical points, aka bond critical points) along the H…NNA axis. There is only one ELF basin of course, a trisynaptic one, with two electrons. I did the calculation using your released wfn file and found the NNA. If you want the file then let me know to what e-mail I can send it to you. Shant: I thought I might answer your question about email in a roundabout sort of way. You might notice my ORCID identifier is appended to all posts and comments (although this latter is not 100% reliable). With the ORCID, you should be able to get my email. Unfortunately when I checked, I noticed that the default privacy setting for this property was (unintentionally) private. It is now public, and so you can now get it there! Oh, in responding to a comment in WordPress, you have to provide your own email. This is private by default, but the WordPress blog goes off and checks if there is an ORCID account associated with that address. If there is, it (mostly) adds the ORCID at the start of the comment. So perhaps if, before posting your next comment, you register an ORCID for yourself, it should appear here. I also appreciate that providing one’s genuine identity to social media used to be considered bad form. But that seems to be changing, and now it is more common to appear using one’s real identity (or one of them). With a world where alternate facts seems in some circles to be acceptable, I feel in science we should only deal with one set of facts (with of course multiple interpretations always possible), and those facts should ideally include one’s identity. I appreciate. Please check your e-mail. 4. All pyramid centres from four nuclei. Using just 1 gives 60 critical points of type (3,-3), which are the Na and He nuclei. Using 1-4 gives 615 critical points of which 76 are type (3,-3). The additional 16 are the non-nuclear attractors, shown in white below. These correspond to the ELF basins in the diagram above. I would add however that the Poincare-Hopf relationship is NOT satisfied, which is another indication that the boundaries of this non-periodic model have artefacts. A quick comment about the speed of the program. MultiWFN finds all the critical points in about 3 minutes on an 8-processor computer. Just a note that the AIMALL program locates 767 critical points, 152 more than multiFN. Here is one property I did not include in the original post, the Wiberg bond orders. Data for these can be found at 10.14469/hpc/2523. It shows that the maximum Wiberg bond index for Na is ~2.48, whilst that for He is 0.15. So the “bond” orders to He are very small, but not entirely insignificant! I am reminded of some discussion about Xe2@C60 (endohedral xenon) where the skeleton of carbon extracts electrons from the Xe, which in the process forms a Xe-Xe bond (DOI: 10.1002/chem.200700467). 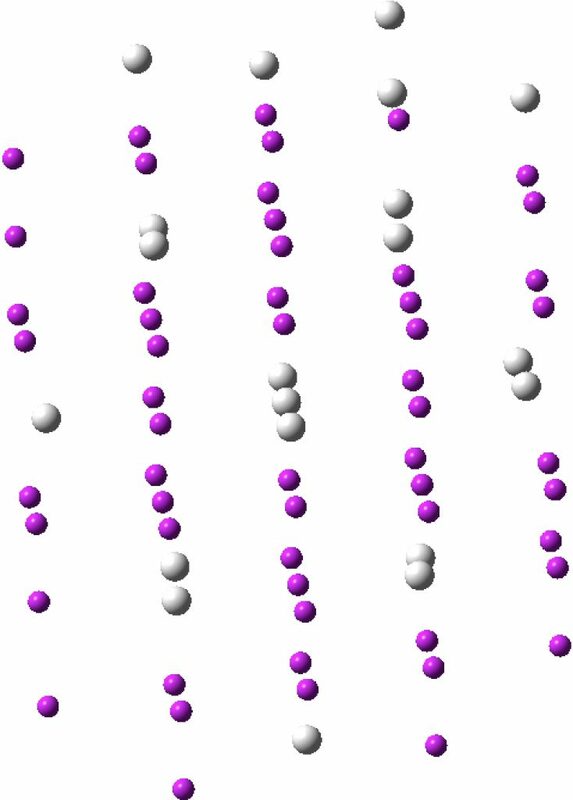 Curiously, He2@C60 is known (DOI: 10.1039/B904234B), although the interactions between the helium atoms are apparently of dispersion strength only. To my previous comment, I add DOI: 10.1002/qua.24916 where a M06-2X/6–31G(d)/QTAIM calculation of He2@C60 is reported. Table 2 is particularly interesting; the He…He distance is calculated as 1.979Å and ν(He-He) is reported as 531 cm-1. ρ(r) at the bond or line critical point in the He-He centroid is 0.0126, which is weak but not insignificant. One might wonder what would happen as the size of the cavity is reduced down to e.g. He2@C28 (10.1063/1.465758(. And I cannot help but note that I could not locate any supporting information, never mind actual coordinates for He2@C60 or indeed a wavefunction which could be analysed. But hey, its a real species, and so if the will is there, the assertions above might be testable!